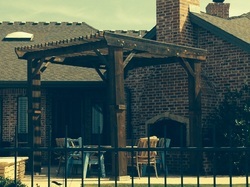 Boerne Deck Builder is a Creative Outdoor Design Service specializing in Building Decks, Pergolas, and Patio Covers. We are a Family Owned Businesses with strong Morals and Values. We believe that our work should reflect our Values in our quality of service, quality of dedication, and quality of effort. Sometimes we joke that we were raised outside because we're all so comfortable working outdoors. We have blended what we love to do with what we do best, and in the process we get to Build Your Dreams. At Boerne Deck Builder, we put Safety first, Budget second, and Design third. But don't be fooled, the most time goes into the Creative and Unique Design of your New Patio or Gazebo. We would be happy to discuss what you envision in your front or back yard. All of our work is Custom and Creatively Designed specifically for your Tastes and your Yard. Call us today or simply send us a message using the form on the right. There's No Obligation, just a FREE Estimate.